Adelaide Oval has been home to South Australian Cricket since 1871, and SANFL matches have been played there since 1877. Adelaide Oval repeatedly tried to attract AFL football to the stadium throughout the 90’s, however the SANFL contract with the AFL forced all games to be played at Football Park. In June 2005, the SACA announced it would challenge the exclusivity of the AFL agreement in the Federal Court believing it was a breach of the Trade Practice Act. In this it had the support of the SA Government. The SACA said seven Victorian clubs had expressed an interest in playing at Adelaide Oval. In July 2005, the AFL announced that the exclusivity deal would be scrapped. However despite this, the AFL also said it did not intend to fixture more games in Adelaide. “It has been the AFL’s consistent view that West ern Australia and South Australia are both mature football markets and one premiership match per week in those states is the right mix for our national competition. AFL football was evenutally played at the ground as a one off event in 2011, before moving to the ground full time in 2014. It was later revealed that the AFL had intended to move Port Adelaide to Adelaide Oval regardless of the SANFL deal. The SACA and the AFL began talking about moving AFL football to the Oval as early as 2007. On December 3rd, 2009, the SA Government announced that an agreement had been reached between the SACA, SANFL, and the AFL, which would enable the hosting of AFL matches at Adelaide Oval, as well as an extension of its capacity to 50,000. The deal, which at the time was worth an estimated $450 million would be funded by the cancellation of the $200 million West lakes tram line, and $100 million in funds that had been earmarked for an upgrade of Football Park. The deal required 100 million in Federal funding.. Compensation for the SANFL’s $1 million naming rights deal for its West Lakes stadium. A guaranteed stadium return of at least $32 million a year, indexed to inflation, similar to its net returns from AAMI Stadium. All funding confirmed for the redevelopment before any agreement is signed. Compensation for any losses through maintaining AAMI Stadium. State Government should use legislation if required to overcome all heritage issues relating to the move. The SANFL has total control of Adelaide Oval from March 1 to October 14 each year. State Government gives major project status to any redevelopment of AAMI Stadium and removes any encumbrances to its development. That a long-term lease is signed for use of Adelaide Oval at “peppercorn” rent. No upfront investment from SANFL into costs of redevelopment and no SANFL responsibility for any blowout in costs. The SANFL will have rights to a clean stadium and the SANFL will determine signage issues. Cricket pitches must be removed during football season. SANFL and SACA to keep all income from car parking, catering and sponsorship in the Adelaide Oval precinct. In early 2010, it was revealed that the Government would boost its funding from 450 million to 535 million. The SANFLs parking demands would raise hackles with the Adelaide City Council, and it was reported in July 2010 that the Council simply could not afford to hand over all the funds from car parking to the Ovals operators. The SMA wanted 3,800 car parks around the oval. There would be 2,100 on the parklands, which were under council control. On July 26, 2010, it was revealed that the AFL and SACA had been discussing a deal for almost 2 years before the SANFL had become involved. On August 10, 2010, the SANFL announced that it was satisfied that the Crows and Power would be better off by up to 8 million a year – simply by moving to the Oval. $8.1 million uplift in revenue. 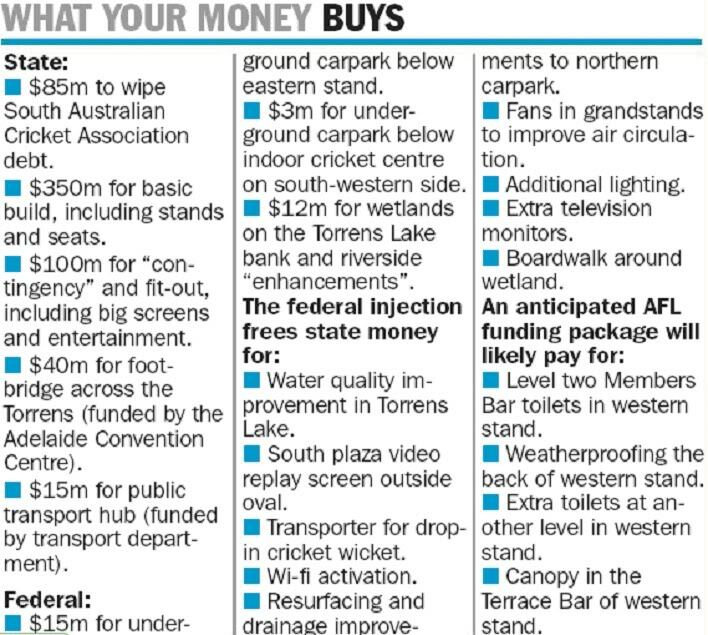 $6.2 million return after $1.9m is allocated for the upkeep of AAMI Stadium as a back-up AFL and SANFL venue. 70% increase in Port Adelaide season-ticket sales (from 13,600 to 23,000). 27% in Power crowds (from average of 24,300 to 31,000). 12% in Adelaide season-ticket sales (24,700 to 27,600). 8% in Crows crowds (39,000 to 42,000). A legal partnership – dubbed “the promoters’ agreement” – setting the terms of the SANFL-SACA joint venture at Adelaide Oval. A carpark centre, with 1200 spots, on the western side of Adelaide Oval. This $45 m project could still become a joint venture with the city council or a private investor. Control of the parklands in the Adelaide Oval precinct with the Stadium Management Authority wanting statutory administration of the area transferred from the Adelaide City Council to the State Government. “Adelaide Oval is cited on parklands – and we respect that,” said Whicker. Federal Government funding, with Whicker vowing to hit Canberra after the August 21 election. The council decided at a meeting in February, 2011 that it would not willingly relinquish control of the parklands. However they might be willing to lease it to the SMA at a commercial rate. By March 27th, 2011, most of these issues were reported as resolved by the Sunday Mail. An Agreement between football and cricket had finally been reached. It just needed the seal of approval from the SACA members. 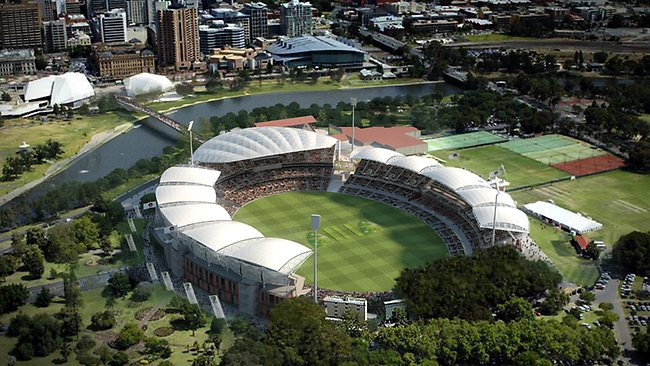 On May 1st, 2011, 80% of the SACA members voted to proceed with the Adelaide Oval redevelopment. On May 4th, 2011 it was reported that the AFL were likely to put about 5 million into the development. On the 29th September, 2011, The Adelaide Oval Redevelopment and Management Act came into law. It defines the area and boundaries of the facility as well as lease arrangements. On December 29th, 2011 the Federal Government announced $30 million in federal funding, which would likely be used for car parking facilities underground. The SMA is the body which manages the Oval. Its board consisted of 4 SANFL representatives and 4 SACA representatives. In March 2013, the SA Government responded to public criticism by seeking legal advice as to whether the make up of the SMA could be changed. However, the respective Act seemed to indicate this would not be possible. Under the Act. The SMA is required to support a sinking fund from its revenues – – to be used solely for the mainteance and upkeep of the facility. Concerns from the two AFL clubs, Adelaide and Port Adelaide, on how the premium football tickets, which are estimated to be priced at $515, would threaten their membership sales. The SANFL protecting its income stream by demanding the league not lose money by moving from AAMI Stadium to the city. The AFL clubs arguing that they, not the SANFL, should sell the tickets at Adelaide Oval. Questions being raised over both the pricing of the $515 premium ticket and whether all 12,200 tickets should be handled by the SANFL. in June 2014, a review of the original deals was launched after both AFL clubs said they deserved a larger share of the revenue after a massive increase in attendances. It was revealed at the start of the review that Port was charged $18,000 for match-day traffic management, whereas the MCG charges clubs $1000 for the same service. In November 2014, the SANFL offered a gradual increase over 5 years, but this was rejected by the AFL clubs. In March 2015, it was reported that the new agreement now turned over 70 cents in the dollar from Adelaide oval to the AFL clubs.Tthe new deal centres on: incentives the Power and Crows will receive if they draw more than 30,000 to the Oval; and the two clubs having access to more stadium assets to sell for corporate revenue and more reserved seats to sell at premium rates. All catering, parking and corporate sales traditionally have been taken — even in the Football Park era — by the venue management, in the Oval’s case the SMA on behalf of the SANFL. Rights to a share of the catering and corporate revenue from AFL finals were written into the Oval stadium deal in February 2015, after the review of the Oval’s ultra-successful launch season in 2014. Catering Profits from those boxes – who knows what the split is. In 2015 the SMA launched a challenge against Port Adelaides Game Day Village – held outside the defined stadium precinct. When it was unsuccessful, the SMA launched its own food and beverage sales outside the Oval. In March 2016 it was reported that fans at Adelaide Oval would face increases in pricing – even though Adelaide Oval is already considered the most expensive stadium for food at AFL games. In 2017, the ABC reported that food and drink prices at Adelaide Oval remain at a “ridiculous” level, punters have said, despite requests by South Australian Premier Jay Weatherill last year to keep prices down. At the Guns N’ Roses concert on Saturday night, concert-goers were forced to spend $9.20 for a common beer such as Hahn Super Dry and $8.90 for a locally brewed West End Draught, while spirits cost $13.90 and soft drinks $5.60.